I need a network which doesn't use "layers" as traditional artificial neural networks do. Instead, I want [what I believe to be] a more biological model. This model will house a large cluster of interconnected neurons, like the image below. A few neurons (at bottom of diagram) will receive input signals, and a cascade effect will cause successive, connected neurons to possibly fire depending on signal strength and connection weight. This is nothing new, but, there are no explicit layers...just more and more distant, indirect connections. As you can see, I also have the network divided into sections (circles). 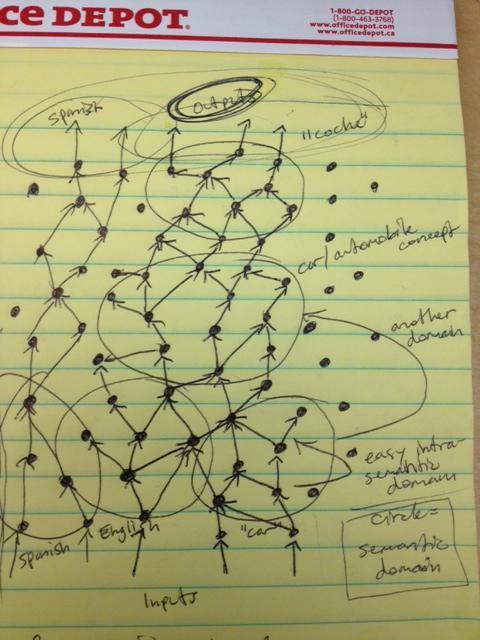 Each circle represents a semantic domain (a linguistics concept) which is the core information surrounding a concept; essentially a semantic domain is a concept. Connections between nodes within a section have higher weights than connections between nodes of different sections. So the nodes for "car" are more connected to one another than nodes connecting "English" to "car". Thus, when a neuron in a single section fires (is activated), it is likely that the entire (or most of) the section will also be activated. All in all, I need output patterns to be used as input for further output, and so on. A cascade effect is what I am after. I hope this makes sense. Please ask for clarification where needed. Are there any suitable models in existence that model what I've described, already? Does a recent general review of recurrent neural networks exist?